“Beneath the Surface” is the title of a new episode of NCIS airing tonight (Oct0ber 30) on CBS, and considering the date, it is not surprising that the episode has a Halloween theme. After NCIS arrives at a Halloween crime scene, Torres recognizes the victim as a former friend from federal law enforcement training. 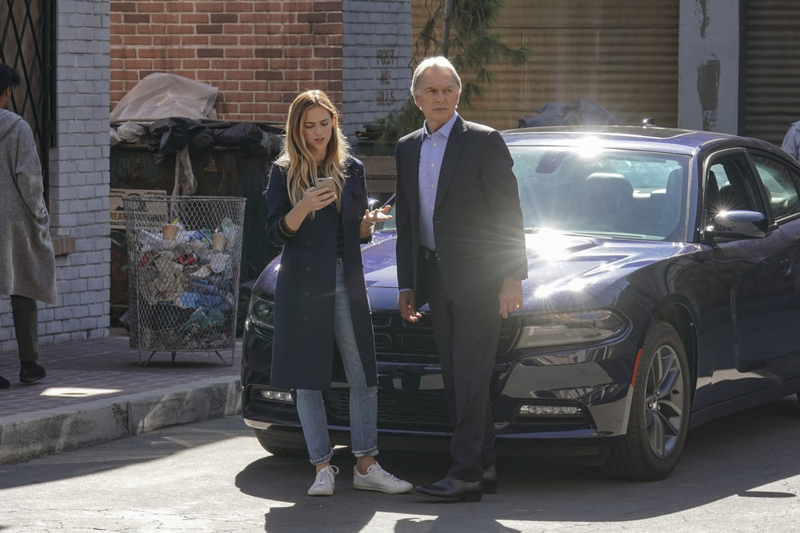 Also, Jimmy thinks his lab is haunted by ghosts when objects keep mysteriously moving, on NCIS, Tuesday, Oct. 30 (8:00-9:00 PM, ET/PT) on the CBS Television Network. NCIS series regular Rocky Carroll directed the episode. Some preview images follow below. NCIS stars Mark Harmon (NCIS Special Agent Leroy Jethro Gibbs), Sean Murray (NCIS Special Agent Timothy McGee), Emily Wickersham (NCIS Special Agent Eleanor “Ellie” Bishop), Wilmer Valderrama (NCIS Special Agent Nicholas “Nick” Torres), Maria Bello (NCIS Special Agent Jaqueline “Jack” Sloane), Brian Dietzen (Dr. Jimmy Palmer), Diona Reasonover (Forensic Scientist Kasie Hines), Rocky Carroll (NCIS Director Leon Vance), and David McCallum (Dr. Donald “Ducky” Mallard. Guest stars in “Beneath The Surface” include Scott William Winters (CIA Officer Westley Clark), Suzanne Savoy (Rachel Brentwood), Justin Welborn (John Zaprowski), Maria Gibbs (Rosie Brown), Sal Landi (Bill Zaprowski), Kirk Fox (Rod Carmale), Rhomeyn Johnson (Trucker Al), Peter S. Kim (Dracula Clark), Will Finley (Adam Neil), Todd Anthony (Navy Lieutenant Connor Reese), and Dawnmarie Ferrara (Trucker #1).